There is a strong desire for change right now. Change of some kind, any kind, is highly sought after by most people who recognize some aspect of inequity, injustice, wrong, immorality or evil in their personal geographical area or the world itself. It’s a good thing to care for, desire, want and yearn for change, otherwise we would stagnate at our current condition and whatever ‘is’ (right or wrong, good or evil, moral or immoral) would persist and replicate into the future indefinitely. This is what I call Truth Type 1 or Level 1. What is currently here, now, in the present (right or wrong, good or evil), is the actual current truth of reality/existence at this time. But, does it have to remain this way? Does the future need to stay the same as the present or the past? No. But we do have to Care to change, for change to even happen at all. Can we each change the whole world all on our own and make everything different for everyone by ourselves? No. Changing the world can be done, but it takes a lot of hard work, effort, persistence, dedication and determination on a personal individual basis first. We have to start with ourselves first (the individual) if we hope for the world (the collective social-environment) to change in a free, peaceful, anarchistic and honest way that doesn’t involve coercive, authoritarian, external control mechanisms like statist government. We have to change ourselves for the better, so that we all add up to a local, national or global aggregate change. And this requires us to learn and think better, and to take in (input) qualityinformation, Knowledge, and then process it to Understand it correctly. We can care to learn and consume what is in the Primacy of Existence. In turn, we can also care to teach and generate back into existence with the Power of Consciousness. It is a feedback reciprocal system of cause and effect for both existence and consciousness. Time is precious, what do you spend your time on? What do you pay attention to? The qualityof information you take in, and the quality of thought you engage in to understand reality, is vitally important if you want to get things to change. What is this quality information we desperately need? That is coming up, but first some explanation is required on how reality/existence can be defined with respect to the term “truth”. Truth Level 1 is the Actual Reality, and is represented by the Actual Truth. That which is (present/now) or has been (past) generated into existence/reality as the actual truth of the current condition, which can be, and is, a mix of both right and wrong, justice and injustice, equity and inequity, morality and immorality, good and evil. But, the good news is WE CAN change things for the better, from our current condition, to create a modified, altered, changed or new way of living, being, acting and behaving. 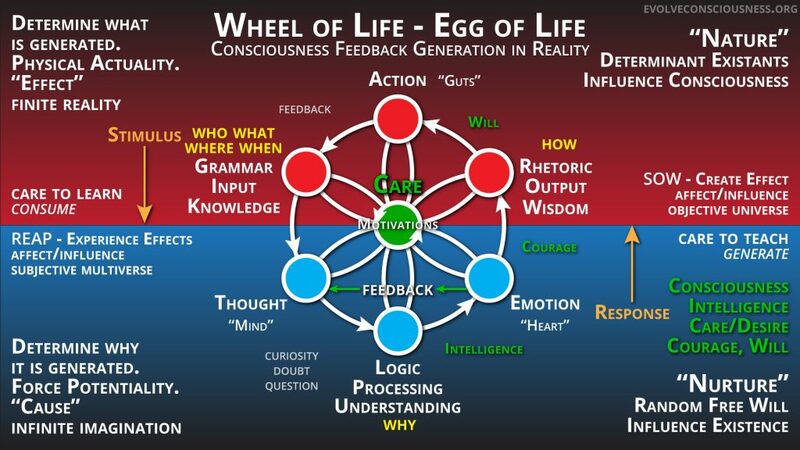 This is where Truth Type 2 and Level 2 is required to be understood to empower us to change things. Truth Level 2 is the Potential Reality (contrasted to the Actual Reality of Truth Level 1) that can be created by the alteration, modification or change in how we choose to act, behave and live our lives. Our potentially different actions will generate, manifest or create different results in the reality/existence around us. This will be creating a new Truth Level 1 – Actual Reality (L1) which is the Truth Type 1 – Actual Truth (T1), as the new current condition that we make it to be! This is the potential reality/existence we can head towards, if we want to and choose to act upon it. What is this new reality based in? How do we get there? We, each individual consciousness, needs to Care/Desire for something in particular in order to improve the quality and condition of our lives, our reality and world we live in. Then we need to have the Courage to learn about it, and also the Will to Act upon it in the end. 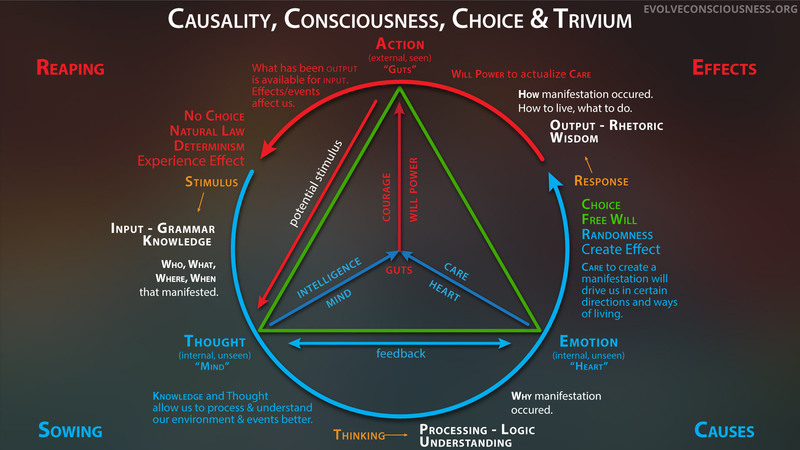 We get to a different potential reality, existence and way of living, by learning about Moral Truth (Truth Type 2), from consciousness understanding about reality and others in that reality/existence. This includes principles of non-aggression, non-violence, doing no harm, and standing for morality and fighting for justice when those principles are violated (i.e. violence). Moral Truth allows us to understand where we can go, and why we should go towards a qualitative, corrected, better and improved Potential Reality (T2), contrasted with whatever the Actual Reality (L1) and Truth (T1) current is. Moral Truth is the Path and Way towards Right, Good, True, Real, Authentic Living. 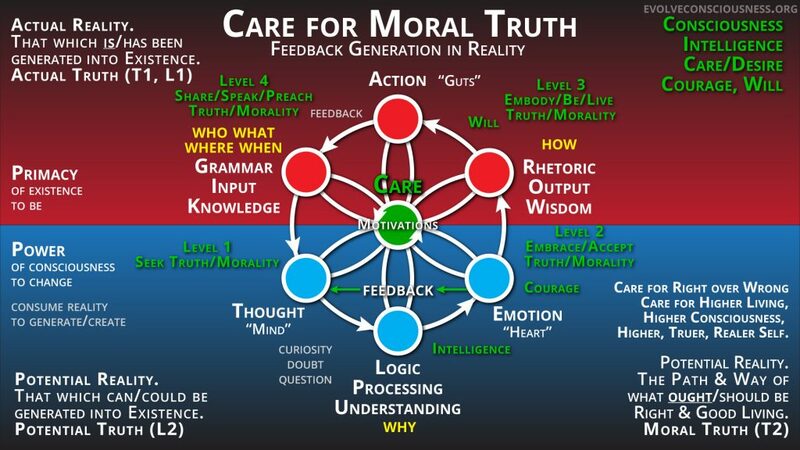 Note though, that Truth Level 2 is the Potential Reality we can create and change our action and behaviors towards, being more good or bad, more immoral or moral. It can be better, or it can be worse. This potential comes from consciousness envisioning and then living up to what we think we should and ought to do. This can be to imagine and envision ideals of good or evil, morality or immorality, and live up to them! Be careful with consciousness, we are our own worst enemies! There is a dual potential within all of us! We can create great good or great evil, all the while self-deluding ourselves and believing whatever we want to believe about what we are doing. We can believe we are doing “good” when it is evil, or doing “evil” when it is good. Just look at how the coercive authoritarian government operates to twist the meaning of good as evil, and evil as good. Consciousness is a great Power, with a lot potential, and with great power comes great responsibility. We each have to improve the quality of our thinking and learning about reality/existence/truth and consciousness/psychology. It is up to each of us to learn Moral Truth (T2), or else we are going to create an Actual Reality/Truth that is not better, but worse! Human history is an example of how this functions. We would be wise to learn from our mistakes, or else we shall be doomed to continually repeat them. The choice is yours, mine and everyone’s to make. Truth or consequence. Be right, or go wrong. We have the potential to become higher quality, truer, realer versions of ourselves, and to reflect that back into the world to make it a better place! Care for Moral Truth. Seek Moral Truth. Embrace and accept Moral Truth. Be, live and embody Moral Truth in your actions. Share, speak and preach the Moral Truth to others for them to Evolve Consciousness just as you have. Together, WE CAN change the world!